So the big draw to the Xbox One is that it's an all-in-one media hub entertainment system; this brand of all-in-one has helped propel Microsoft's latest system to more than two million SKUs sold. You can go online and surf the web using voice commands (although you probably wouldn't want your wife hearing what you're searching for), you can watch movies, stream content, play games and even upload game moments while skyping with friends... if you pay extra for Xbox Live Gold. Real Gamer Newz decided to do a real breakdown of the cost-to-feature ratio for the Xbox One and what you get and what you don't get straight out of the box. Here are all the features listed that you CANNOT use unless you're a current subscriber to Xbox Live Gold. Microsoft is basically aiming to get more money off gamers than welfare abusers hope to get from tree-hugging liberals. A lot of gamers were also about as angry as feminists at a Maxim photo-shoot when they found out that you can't even use the built-in web browser without paying extra to do so. That's right, stuff you can do for free on your PC requires a fee on the Xbox One. That's the future, folks. The main impetus that brought about this discovery from Real Gamer Newz came from the 2.5 second consumer warning flash during the Xbox One commercial, you know that one with the guy and the girl and the whole promotion of the Xbox One being an all-in-one media hub? Yeah, that one... the same one you can watch below. “Screens simulated. Sequences shortened. Games sold separately. Additional subscriptions and/or requirements apply for some features. See Xbox.com/XboxONE”. While the 2.5 second flash of the consumer warning is a disingenuous way to forewarn consumers, the bigger crime is in the inoperable way the Xbox One functions right out of the box. What can you do with the Xbox One once you plug it in? Nothing. Nata. Zip. Nilch. You can't play games, you can't watch movies, you can't even watch TV on your TV through your Xbox One. Basically, you need the mandatory day one patch just to remove the DRM that prevents your $500 entertainment device from being little more than a heavy, fragile brick. Why Microsoft would make such a decision is absolutely beyond me, but it completely cripples the console for basic use straight out of the box. Heck, you could even plug in and play games right out of the box with the Atari 2600... how is it that the Xbox One is the future of home entertainment when it can't do something as basic as a console that's more than 30 years old? Even more than that is once you get the mandatory patch installed, you still can't do diddly squat without Xbox Live Gold. 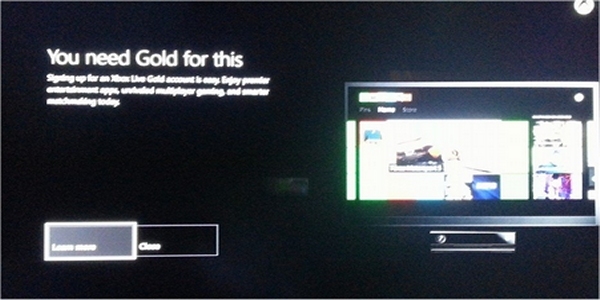 As mentioned, all the TV, media streaming and interactive apps all require Xbox Live Gold. So not only does the Xbox One allow you to watch TV on your TV but you have to first pay to access the option to pay to watch TV on your TV. Dear word, someone needs to make an Xzibit meme for that one.